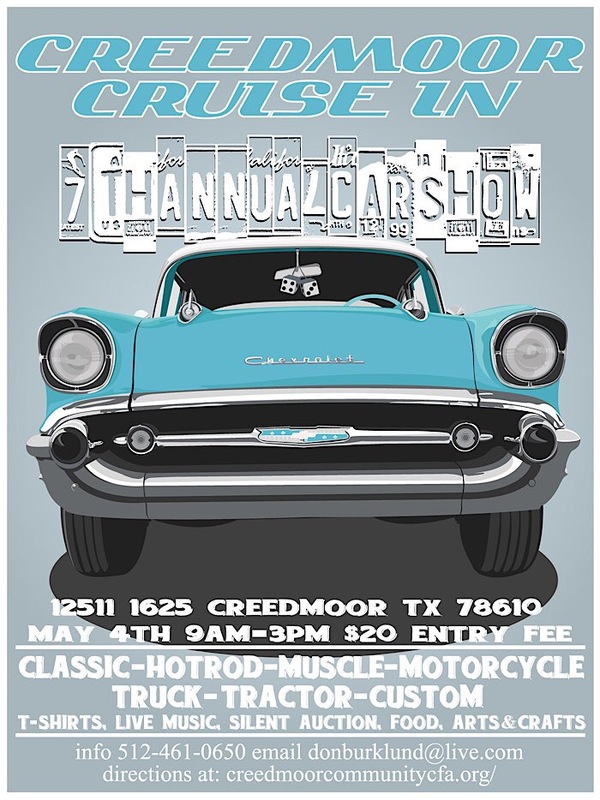 Creedmoor Cruise In will be on Saturday May 4th 2019 from 9:00 till 3:00 PM. It will be held at the Creedmoor Community Center located at 12511 FM 1625, Creedmoor, TX 78610 in conjunction with the May fest. This is a rain or shine event it will be held under the large pavilion behind the Community Center. Show is free for spectators or enter your Classic Hot Rod, Muscle Car, Motorcycle, Truck, Tractor or Custom Car for $20.00 participants get a T Shirt, Goodie Bag, Live Music. Awards will go to Top 30 entries. Awards Presentation at 2:00 PM. This is a kid friendly event with Arts & Crafts, Silent Auction, Food and restrooms all inside the air conditioned Community Center.